After weeks of tolerating life with a broken wallet (which would spontaneously burst open, flinging its contents all around the room), I decided it was finally time to purchase a new one. This brought about the tedious task of transferring an abundance of cards from one wallet to another. It was only then, that I realised quite how much of my wallet was packed with the marketing attempts of a variety of different companies. To my frustration, I also realised how well these companies’ marketing attempts were working… because I simply couldn’t bring myself to dispose of any of these loyalty or rewards cards that were stealing space in my wallet! 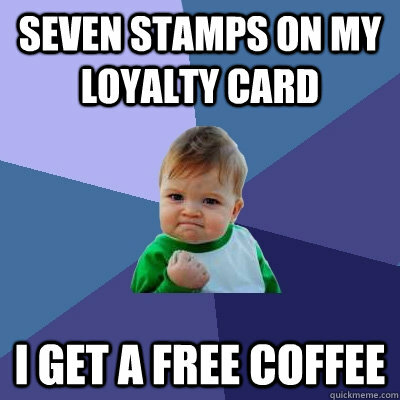 Each loyalty cards entitles me to receive a free item after purchasing the same item a specified number of times prior. For example, my Boost Vibe Member card allows me to get a free Boost juice on every 10th purchase at Boost. My Rush Coffee card enables me to receive a free coffee every 9th purchase, and my Panizzi card offers me a free toastie on every 8th purchase. These loyalty cards are a perfect example of behavioural learning theories being applied to marketing strategy. In particular, they demonstrate the use of instrumental (operant) conditioning. Instrumental conditioning is based on the idea that “learning occurs through a trial-and-error process, with habits formed as a result of rewards received for certain responses or behaviours” (Schiffman et al. 2014, p. 208). It involves the use of positive reinforcement, negative reinforcement and punishment to shape the behaviour as desired. B. F. Skinner first documented the concept of instrumental conditioning and demonstrated its power by training animals to perform extraordinary actions (Weiten 2014, p. 9). For example, he managed to train pigeons to play an adapted game of table tennis – as shown in the clip below. Relating this back to the loyalty cards, we can see that instrumental conditioning plays a major role in their effectiveness. Every time your card is stamped, ticked or swiped, you are receiving a form of positive reinforcement. This creates a positive association with the behaviour demonstrated (that is, your purchase of a product/service from a particular place) and makes you more likely to repeat this behaviour in the future. This concept is simple, yet incredibly effective. It is not until now, that I realise how influenced I am by these small pieces of plastic/cardboard in my wallet that promise a reward. Subconsciously, it does not matter to me that I will spend $45 before obtaining the final $5 reward… It is enough to convince me to pick one coffee shop over another – which is exactly what our marketers aim for. BFSkinnerFoundation, 1950, BF skinner foundation – Pigeon ping pong clip, online video, 1 April, BF Skinner Foundation, viewed 1 May 2014, <http://www.youtube.com/watch?v=vGazyH6fQQ4&gt;. McDonnel, 1998, George’s exploding wallet, online video, 8 August, Seinfeld, viewed 1 May 2014, <http://www.youtube.com/watch?v=gwEmQNd6wMA&gt;. Schiffman, L, O’Cass, A, Paladino, A & Carlson, J 2014, Consumer Behaviour, 6th edn, Pearson Australia, Frenchs Forest, NSW. Weiten, W 2014, Psychology Themes and Variations, 9th edn, Wadsworth, Belmont, California. Feeling hungry after an evening lecture on consumer research, I opened the fridge in search of some butter for my toast. As my eyes latched onto the right colours, design and packaging that I associate with my favoured Devondale Dairy Soft, I noted how incredibly well our marketers have trained our minds! I then scanned my eyes around the fridge, considering the idea that every product in there was likely to be a result of careful and strategic consumer research. It reminded me of a consumer research experience that my mum often mentions. I lived in England when I was younger; there, in my opinion, the best butter is Lurpak. A few years before I was born, a market researcher on the street offered my mum £20 to participate in some consumer research, to which, she agreed. She was one of 8 participants in a focus group with a moderator leading the group through a set of questions for discussion. Under primary research, there are two categories: qualitative and quantitative research. Focus groups are a qualitative technique, as are depth interviews and other related approaches (Schiffman et al. 2014, p. 19). Used since as early as the 1950s, focus groups are known to be extremely useful in marketing decision-making processes. However, they require highly experienced moderators to ensure that results are not biased (Cox 1976, p. 77). It was not until later that my mum understood why such a strange question had been asked… Out came advertisements featuring Douglas, the Lurpak man! Douglas became a well-known mascot for the brand, and the company then kept the campaign running for over 15 years! The fact that Lurpak could keep the ‘Douglas’ campaign running for so long demonstrates that their extensive marketing research was definitely worth the expense. Without consumer research, companies can invest huge amounts of money into a product or campaign that is immediately hated by consumers. Perfect examples of this are Vegemite’s iSnack 2.0 and Nike’s awful 2000 television advertisement! Lurpak is a great example of a company that used research effectively to ensure that their new campaign would be taken well by consumers. Cox, KK 1976, ‘Applications of focus group interviews in marketing’, Journal of Marketing (pre-1986), vol. 40, no. 1, pp. 77-78. Doyle, C 2011, ‘Questions’, in The Oxford Dictionary of Marketing, vol. 3, Oxford University Press, New York. Trott 1986, Lurpak Ad (1986), online video, 5 November, YouTube, viewed 20 March 2014, <https://www.youtube.com/watch?v=-FuHQJi1keA >. Time flies when you’re having fun, right? Here we are, having reached Week 7. It feels like no time since I was timidly writing my first ever blog – and already it’s time to say goodbye to my blog site… for a short while, that is! Physically writing blogs each week has made me realise the extent to which the media plays a part in our lives and how natural it has become for us. I had read, reflected upon and gathered information from many blogs in previous years but had never actually considered writing one. When I was given the task of blogging about my media findings and new understandings each week, I found the process of setting up my account and presenting my posts to be simple. It reminded me just how adapted we are to the media-centred and technological world we live in. It really is second nature to us. Both the experience of blogging and the work covered over these recent weeks has stirred thought into the content of information fed to us by the media. Blogs themselves portray a combination of facts and opinion. They make for entertaining and enriching reading. However, previously I would have taken too much as being ‘solid information’ – always assuming credibility. I have definitely begun to consciously consider the reliability and bias of the information and news I receive through all media sources, taking into account its owner and what their motivations might be. It has caused me to think very critically about the articles I read and the images and footage I view. None of this is to say, however, that I now have fear, disgust or any such feeling towards the media. Rather, that I am aware of its power, motivations and of both its positives and negatives. The media effects model, discussed in earlier weeks, mimics my early assumptions of the media in our everyday lives – that was, before I became better informed. Blaming the media is an easy option and I can now see how I was led to believe it was the cause of so many issues in our society. Media must be regulated to ensure it does not push boundaries and go too far. However, the fact that the media has pushed boundaries has allowed us, as a society, to become a lot more open-minded and accepting of change. 2012, The Fight for Better Media, image, Free Press, viewed 15 April 2013, <http://minurl.net/955799>. Jurgen Habermas developed the idea of the public sphere, as a place where citizens could come together to discuss the ‘matters of the day’. “By ‘the public sphere’ we mean first of all a realm of our social life in which something approaching public opinion can be formed” (Habermas 1964). In our modern society, the ‘mediated public sphere’ is prevalent, with increasingly advanced media technologies and the expansion of social media. An almost endless range of issues can be raised and infinitely discussed by those with access to such media – each offering their individual opinion to the matter. The matters discussed in the mediated public sphere are often brought to attention through new texts, including books, movies and television shows. 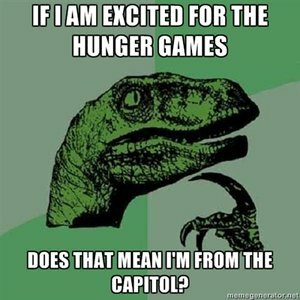 Take ‘The Hunger Games’ as an example. Initially a trilogy of books written by Susan Collins, the first book was soon formed into a movie… And who wasn’t aware of the (ongoing) hype? However there was more than just this. Far deeper questions and issues were raised by the book and movie, ‘The Hunger Games’. The suggestion of a world that is controlled entirely by one central force, the ‘Capitol’, brings thought towards our own future. Is the dystopian future, demonstrated in The Hunger Games, reflective of a future society in real-life? It certainly provokes discussion into the conspiracy theory of ‘New World Order’. The Hunger Games, in many opinions, is seen as a reflection on not only the future society, but also today’s society. Our heavily promoted reality-television shows seek to satisfy an audience – in whichever way brings the most views and followers. Think of just a few reality-television shows… it soon becomes apparent that we love to watch people experience extreme levels of stress and endure intense physical and mental strain. How far will the media possibly go for entertainment before ethics overrides? The Hunger Games brings many other valuable discussion points into the mediated public sphere also. Some of these include: government control and influence, treachery, war, television violence, superficiality, inequality, oppression, independence, class warfare and surveillance . With each issue raised, comes a variety of viewpoints. This forms the basis of public opinion. The introduction of social media, however, allows for a broader range of viewpoints to come into play. 2011, Team Peeta vs. 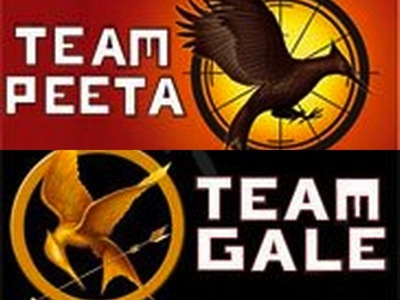 Team Gale, image, Book Equals, viewed 14 April 2013, <http://www.bookequals.com/2010/08/03/the-hunger-games-team-peeta-vs-team-gale/&gt;. Did you know that PVA glue is often used instead of milk in breakfast cereal advertisements? Real milk doesn’t look good under the special lights and it makes the cereal go soggy, thus looking less appetizing! (Casimir, 2010) This is just one of many tactics used to give the preferred impression of a product to its viewers. What you see is not necessarily the ‘real deal’. So if advertisements are tailored to benefit their producers, what is to say that the rest of our media isn’t adapted similarly? Absolutely nothing. If the media we view daily was coming from a wide variety of sources, this would not pose such an issue. The concern is, that it does not. Rather, media ownership is often viewed as somewhat ‘incestuous’. Many people would be surprised to find just how connected and interlinked our media owners are. Their companies own a range of different types of media – often covering television, newspapers, magazines, radio and web. This allows them to connect with wider audiences and to release their content through more than just one medium. Media can be highly influential and therefore, when delivered by such a select source, one must begin to question the actual content of news updates and information we receive. Hart (2011, p. 402) states that, “Whoever owns the media owns the message”. 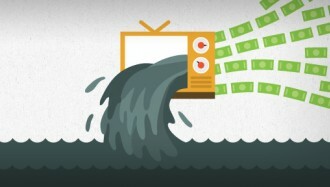 When evaluating a media article, we must understand the motivations of its owner. It is too easy for messages in the media to be given from biased perspectives to seek specific benefits. A classic example is Gina Rinehart and her influence over articles regarding mining. Although we may be aware of such bias, it is near impossible to avoid the daily flow of media that surrounds us in our everyday lives. Media owners have the power to influence the public opinion on almost anything – from the reputations of celebrities, to the reputability of political and world leaders. In fact, this power is found to be so strong that The Bulletin named Rupert Murdoch as “The most influential Australian” in 2006. The news we hear about and the facts we base our political opinions upon are subject to the media we receive. We depend too greatly upon the credibility of this media. Casimir, J 2010, The Gruen Transfer, HarperCollinsPublishers, Sydney. Hart, E 2011, ‘Case study 6: media ownership’, in J Bainbridge, N. Goc & L Tynan (eds. ), Media and Journalism: New Approaches to Theory and Practise, 2nd edn, Oxford University Press, South Melbourne, Victoria, pp. 400-408. Through the act of what some people like to call, “research” and others admit, “procrastination”, I happened to stumble across this rather unique advertisement. I’ve posted it because I believe it serves as a somewhat interesting link between my previous two blogs… Well, see what you make of it! Denotation & Connotation: Does drinking beer make you ‘manly’? From the days of black and white television, to our modern world today, beer commercials have been recurrent – each with unique styles and added humour. In my opinion, this Heineken advertisement is one of the greats! It could be seen as controversial in some respects however, and can be discussed through Roland Barthes’ model of denotation, connotation and myth. In terms of denotation, we look at the commercial and recognise that its visual and linguistic signs demonstrate a woman giving a tour around her house. When the woman opens doors to a full walk-in wardrobe, the other women begin screaming, hugging and pointing until another noise interrupts. This noise comes from four men who are also screaming, hugging and pointing, but from within a different, fridge-like room, full of Heineken beers. Simple enough to recognise… But what gives meaning to those 30 seconds of footage? The answer is: connotation. “Connotation signifies a second-order meaning of the original sign” (Hobbs, 2012, p. 90). It adds further significance and value to the primary signs, adding a new realm of interpretation to the text. When the walk-in wardrobe lights up to reveal a large array of women’s clothes and shoes, simultaneously, the women’s faces light up. This tells us that the screams from the women are that of joy and excitement. The men’s screams and actions replicate the women’s when they see their walk-in fridge, although the reaction is even more exaggerated. This gives the impression that the beer is equally, if not more, exciting than the clothes! The advertisement is controversial however, in its stereotyping of males and females. Take a second look at the contents of the walk-in wardrobe. It boasts a brightly coloured surplus of shoes, jackets and accessories, contributing to the labelling of these women as fashion-obsessed, squealing ‘girly-girls’. The men, on the other hand, are rowdier and solely focused on one thing. The beer. Not only does this represent men as being ‘simple-minded’, but also stereotypes beer as a man’s drink. Regardless, the genius of this commercial cannot be undermined in my opinion! Rather, what is important to note, is the power of connotation. 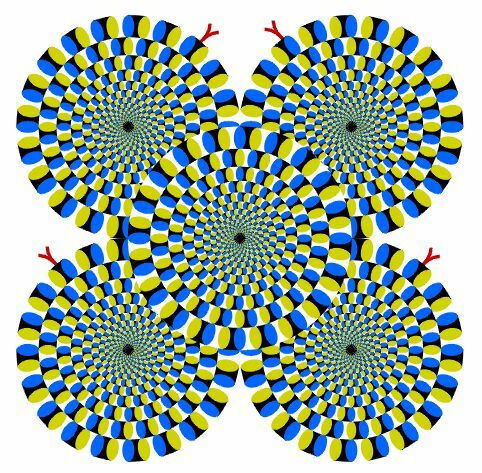 It could be likened to viewing the hypnotic image below (Kitaoka, 2003). Although it is actually a still image, it is specifically designed to ensure that more than just a still image is perceived. When we view complex or controversial texts, we naturally interpret and take in deeper meanings than just the surface denotations. It is out of our control. Thus, advertising can be extremely effective. Hobbs, M 2012, ‘Semiotics: making meaning from signs’, in T Chalkley, A Brown, T Cinque, B Warren, M Hobbs & M Finn (eds. ), Communication, New Media and Everyday Life, Oxford University Press, South Melbourne, Victoria, pp83-96.